Following is the third part of a series of articles on the Civil War and how it affected the people of Fairfield and Westport, in conjunction with the 150th anniversary of the conflict. More than 1,300 African- and Native American men served in the Union Army during the Civil War as members of the 29th Connecticut Volunteer Infantry Regiment, 13 of them from Westport and 33 from Fairfield. The full complement was reached in January 1864, almost four years into the bloodiest war in American history. The soldiers organized at the Fair Haven section of New Haven and mustered in on March 8, 1864. They left the state on the ship "Warrior" on March 19 and headed for Annapolis, Md. They were not issued their muskets until April 6, and then sailed again on April 9 for Hilton Head, S.C. After arriving in Hilton Head on the 13th, they were ordered to Beaufort, S.C., where they stayed on duty until August, then sent to Bermuda Hundred, Va. Attached to other corps and regiments, the 29th soldiers saw engagements in Virginia at Petersburg, Chapin's Farm, Richmond, Darbytown Road and Kell House from August through October. They fought 44 battles throughout Virginia in the latter part of 1864 and the first four months of 1865. At the end of the war, 198 men had lost their lives -- 45 were killed in battle or died from wounds and 153 had died of disease. By the time the units mustered in, President Abraham Lincoln already had issued the Emancipation Proclamation on Jan. 1, 1863, freeing the nation's nearly 4 million slaves, over which the Civil War was waged. 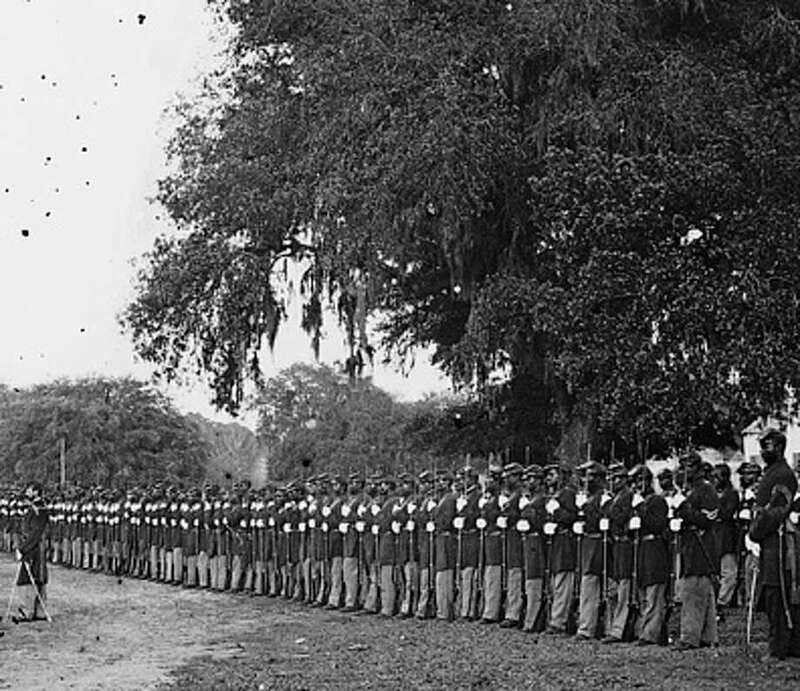 Although they served in the Union Army, the soldiers in the 29th were treated poorly. They faced bigotry, rarely if ever were paid and few of them were promoted. The 29th Infantry was the first regiment to enter Richmond, Va., on April 3, 1865, one day after Gen. Robert E. Lee evacuated the capital of the Confederate forces. "By the earliest dawn, the Twenty-nine was in marching order and eager for the pursuit," wrote the Rev. Henry G. Marshall, a captain of Co. I, in a history of the 29th Infantry. "The men were soon over the breastworks, through the bristling abbatis and the thickly planted torpedoes, and in the deserted rebel fort. They found the guns spiked and the tents standing, but with every breadth of canvas slashed by a knife. They waited to see no more, but hurried out upon the high road to Richmond, which was strewn with articles cast aside by the retreating rebels. Then began the exciting race to first reach the burning city, the flames and smoke of which could be distinctly seen. Two companies of the Twenty-ninth, C and G, were ordered forward as skirmishers and were the first infantry to reach the city." In Port Lookout, Md., until May 28, the infantry guarded Confederate prisoners of war, and then on June 10, sailed to Texas, stopping in Brazos, Santiago and then Brownsville, where they were on duty until October. They faced considerable bigotry and discrimination while stationed in Brownsville and were eager to sail to Louisiana. 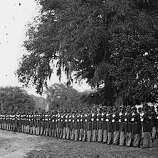 They mustered out on Oct. 24, 1865, were in New Orleans until mid-November and were honorably discharged in New Haven on Nov. 25, 1865. They were welcomed home as heroes at a celebration in Hartford. The regiment was organized after Lincoln, supported by Gov. William Buckingham, called for an additional 300,000 men in late 1863. Colored regiments already had been established in Massachusetts and Rhode Island and in the South. In his autobiography "Out of the Briars," Alexander Newton, a minister and commissary sergeant in the 29th Infantry, wrote of his belief and those of his comrades for why they enlisted, --¦we said that we would honor Old Glory, obey God, and contend for our prize, Liberty, and will contend in this conflict until the sound of clanking slave chains shall be heard no more in the length and breadth of this fair and goodly land." He continued later, "I knew that slavery and its inhuman machinery must be put out of existence and that the simple principles of liberty of thought and action in politics, society and religion must prevail." The average age of the men from Fairfield and Westport was 25. There were laborers, shoemakers, mechanics, a printer, boatmen, farmers, waiters, hostlers and a servant. The majority of them were born in other states, primarily New Jersey, New York and Pennsylvania and a couple them in the South. Laborer William Johnson was born in Westport and was 36 years old when he enlisted. He died on April 12, 1908, at the age of 72, and is buried at Spring Grove Cemetery in Darien. Joseph Alexander, 22, who was promoted to full corporal in January 1865, was born in Fairfield and was a farmer. He died on Aug. 12, 1903, and is buried at Cypress Hills National Cemetery in Brooklyn, N.Y. Twenty-eight years old and a laborer, Burr Nichols (or Nicholas on some archival records) noted in enlistment papers that his place of birth was "Greenfield, Conn.," presumably the Greenfield Hill section of town. Born in Easton, Michael Nichols, who was 18 when he enlisted and a laborer, is possibly the only one of the 46 men to be buried in either town. Nichols died at the age of 70 on July 31, 1917, and is interred at West Cemetery on Post Road in Fairfield. During the war, he was a private and spent a good amount of time in the hospital. By March 1865, he was discharged on a disability. In the 1910 U.S. census, Nichols, who listed himself as farm laborer, was living in Fairfield with his wife, Lulu, who was 38 years his junior, and their two children, Grace, 3, and Allie, 10 months. The couple had two other children who died. Nine soldiers from Westport and Fairfield died during the war. Charles Van Tross of Westport died of disease on Oct. 9, 1864. Twenty-five-year-old Thomas Benson of Westport, a laborer born in Passaic, N.J., enlisted in the 29th on Christmas Eve in 1863. While he entered the 29th Infantry as a private, he never saw active duty as he died on Jan. 7, 1864, at U.S.A. Hospital in New Haven. A laborer from Westport John Thompson, also born in Passaic, was 23 years old when he enlisted on Dec. 24, 1863. He died of pleurisy while stationed in Brownsville, Texas, on Sept. 21, 1865, and is buried at Alexandria National Cemetery in Louisiana. Twenty-seven-year-old Martin Storms of Fairfield, born in Bedford, N.Y., served through most of 1864 until October when he became ill. He died of disease the following summer in Brownsville, and is buried at Alexandria National Cemetery. Richard Copelin, 29, a laborer from Fairfield, never left Beaufort, S.C., in 1864. He died of disease in June, nearly a year before his comrades entered the fallen city of Richmond, where he was born. He is buried at Beaufort National Cemetery in South Carolina. One of the fiercest battles for the 29th was the engagement at Kell House in Virginia. On a reconnaissance on Darbytown Road with the Second Brigade, Third Division, Tenth Corps in mid-October 1864, the 29th then participated in a forward movement of the Army of the Potomac on Oct. 27 and 28. "The Twenty-nine formed the skirmish line of its division, and drove the enemy into their works and kept them there. The men behaved admirably, remaining on the advanced line through the entire night, till relieved in the morning. It was the only regiment meeting with loss in this affair at the Kell House. Its loss was eighty. Soon after, the regiment was placed in the First Brigade and assigned the duty of garrisoning the line of forts along the Newmarket Road, a most important duty," wrote Marshall. Henry Thompson and George Peterson, both from Fairfield, died from wounds received in the battle. Born in New York, Peterson, 21, who listed his occupation as sailor, enrolled on Dec. 14, 1863. He died at the base hospital near James Landing, Va., on Nov. 17, 1864, from the gunshot wound he received at Kell House. A shoemaker born in Maryland, Thompson, 21, also was wounded in that battle and died on Nov. 2, 1864, at the base hospital. He is buried at City Point/Petersburg National Cemetery in Virginia. Thirty-three-year-old Benjamin Maticer of Fairfield, a farmer born in New York, mustered in as a private on March 8, 1864, but the only battle he saw was in a street fight in New Haven. He died at the U.S.A. General Hospital from gunshot wounds. After spending some time ill in the hospital at Beaufort, Hiram Brown of Fairfield was wounded in action on Oct. 27, 1864, at Kell House. He was issued a disability discharge in March 1865. Situated at Criscuolo Park where the Mill and Quinnipiac rivers meet in New Haven, a nine-piece black marble monument commemorates the contribution and bravery of the members of the 29th. Two marble benches also are in place for people to reflect on the past. Harrison Mero, the president of the Descendants of the Connecticut 29th Colored Regiment C.V. Infantry Inc., who had four ancestors who served in the Civil War, two of them in the 29th, said the group began informally. After the first president, Emanuel Gomez, wrote a story about the 29th, Mero's brother Albert, the family's historian, contacted him and they got together. It started out as two families sharing interests and concerns; then by word of mouth, others joined. "It didn't take long," said Mero. As the interest grew, the discussion turned more serious. The group became incorporated as a nonprofit organization and began developing a plan to erect a monument. "When we formed, we decided that these guys should have a monument unique to themselves." Funds were raised through private and public donations, including the state and the city of New Haven. The site, which was called Grapevine Point at the time of the Civil War, was chosen so the public could have access to the monument. "The park where monument is, is the same location of the encampment. That is the reason why we put it there." The effort took nearly 10 years, culminating in the dedication of the monument, designed by sculptor Ed Hamilton, in 2008. When the men left for the Civil War, the African-American women of New Haven presented the commanding officer with the regimental flag. The 29th descendants found the flag's manufacturer, which still had a print of it, so the group obtained a duplicate. It is emblazoned on the 8-foot-tall obelisk. Mero said the group is planning a fundraising event after the summer and recruitment of members. "Right now we are old people," he said. Membership is open to everyone -- black, white, Native American and other groups - because the regiment itself was integrated. New members, he said, "have to have a strong desire to promote the history." Not only does the monument pay tribute to the men of the regiment, but it is a focal point of the organization's now primary goal -- educating the public about the 29th Infantry and the doors it opened for the African-American community, including becoming politically active and abolishing archaic and discriminatory laws. "The regiment was like a catalyst to a continuation. That was one thing these guys were determined to maintain was a close cohesiveness. They figured they had proven the point, the trust had built up and these guys were worthy of the uniform and clearly demonstrated that." Information for this installment was gathered from the archives of the Fairfield Museum and History Center and the Westport Historical Society; ancestry.com; the Connecticut State Library; civilwararchive.com; 29thregiment.com; Fairfield genealogist Melanie Marks; "The Military and Civil History of Connecticut During the War of 1861-1865"; "Connecticut African-American Soldiers in the Civil War 1861-1865" by Diana Ross McCain; "A Sketch of the 29th Regiment Connecticut Colored Troops" by J.I. Hill; and "Out of the Briars" by A.H. Newton, D.D. For information about the Descendants of the Connecticut 29th Colored Regiment C.V. Infantry Inc., visit http://conn29th.org. The final installment in the series will take a look at the Fairfield and Westport homefronts during the Civil War.